Hil! I’m Jen from 100 Directions. I’m delighted to be a part of this year’s Teacher Appreciation series on Skip to My Lou! I’m an Illustrator and Designer at JGoode Designs, my Denver based art studio and I LOVE all things creative. I really enjoy creating all kinds of art and craft projects but especially love to doodle art on to anything I can get my hands on. I am always looking for ways to add my own personal touch to everything, so I’m super excited to share this card kit with you so you can add your own personal touch too. I hope it inspires you to get creative! At our school, the class moms usually coordinate a group gift for all the class parents and kids to join in on. 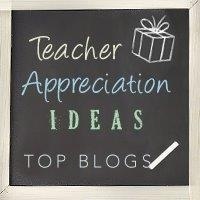 The teachers share a list of their favorite things at the beginning of the year, so every time we want to give a gift we can take a look and all pitch in for something perfect to give each teacher. 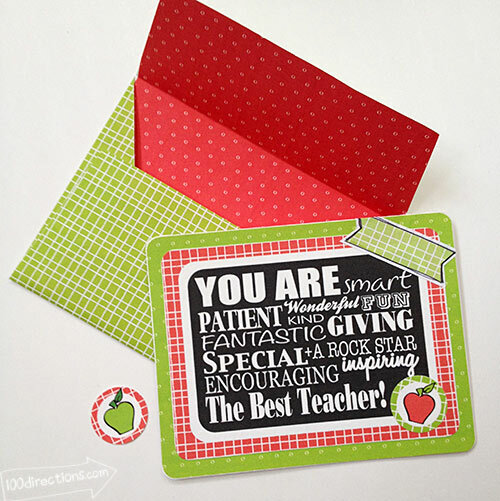 I love this idea, but I also like being able to give the teachers something special that my kids are a part of. 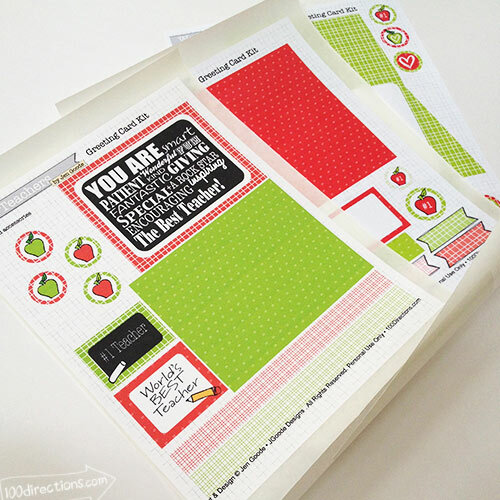 I’ve designed this card kit so you can make it yourself or make it with your kids. 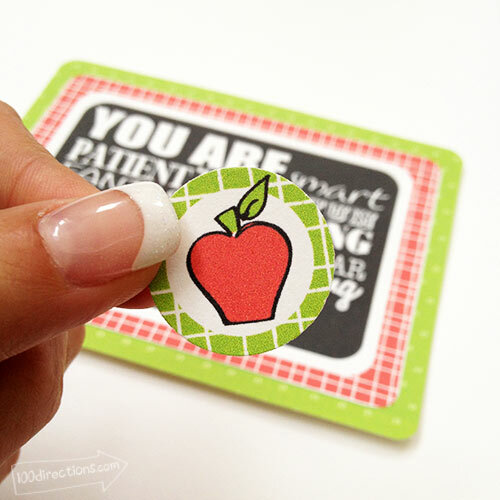 Add the card to gifts you are already planning on giving or use it as a craft projects your kids can make for their teachers. 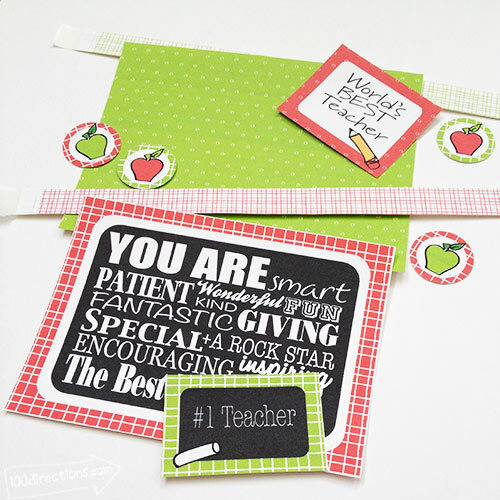 You can also use the pieces and parts to create gift tags or even decorate other gifts you are making for your favorite teachers. Have fun! You can use any adhesive you’d like, I like the ease of application with the Xyron machine. Also, for extra sparkle, you can add your own glitter or other embellishments. For a little extra dimension, add foam adhesives in between the layers. The kit comes with 3 pages goodies you can use. To make the card, cut out all the pieces on page 1, add adhesive and apply where ever you’d like. I layered the word art on top of the green pattern block and then added extras. Using my Xyron machine, I turned all the little cut out piece into stickers that I then used to decorate my card. I also rounded all the corners of my card pieces. You can do whatever you like with the card pieces, have fun with it! Create the outside of your card by layering the message and additional decor piece on to a piece of white card stock or a blank white card. Then decorate the inside of your card however you like. Add a message and any extra goodies. The envelope is a little tricker. 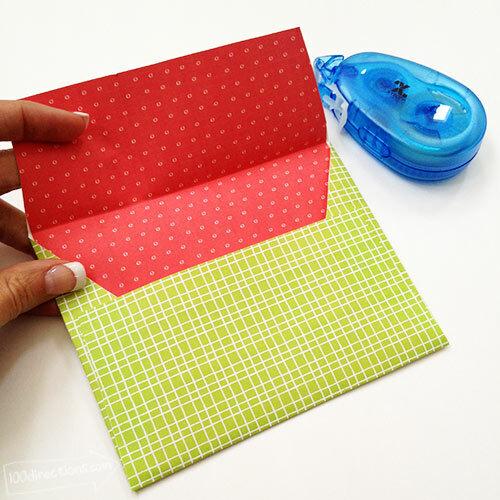 Cut out the envelope shape on the printable pages 2 and 3. 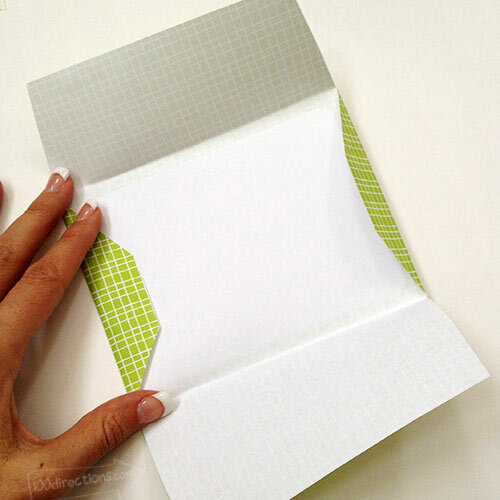 Fold all the flaps on the green envelope piece inward. Adhere the red envelope inside piece to the black side of the envelope you just folded. Continue to fold and glue the flaps in place. That’s it! You can leave off the red inside piece if you’d like and use it for something different if you’d like. 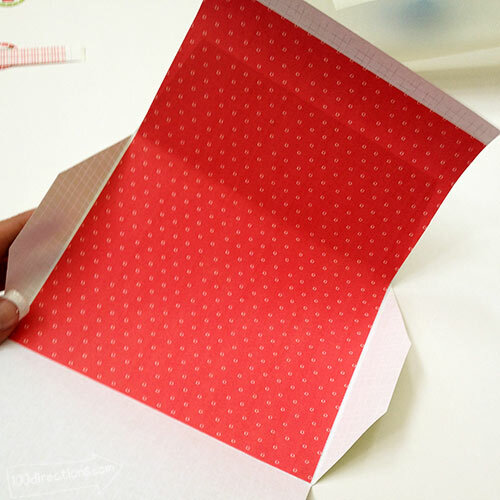 Decorate the front of the envelope and if you’d like the mail the card, the kit also comes with mailing labels. 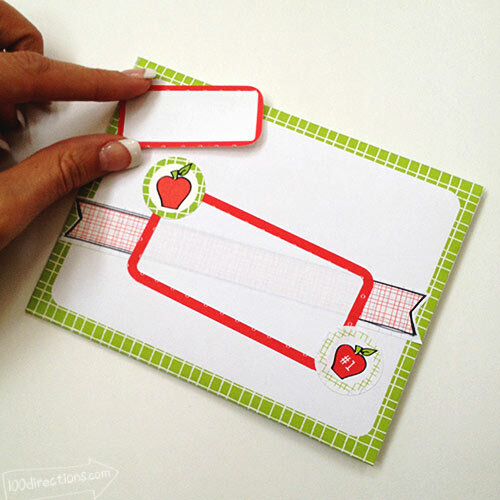 You can use the extra ribbons and apple circle art pieces to decor the card, envelope or even use as cupcake toppers. 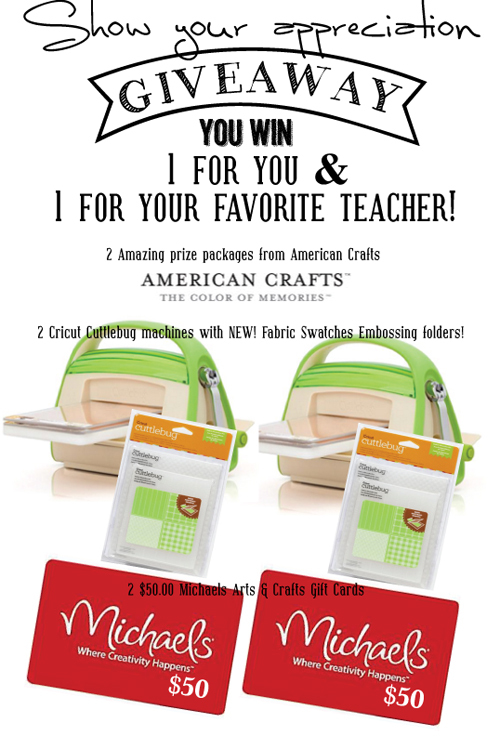 Get creative, have fun and show off your appreciation for all your favorite teachers! 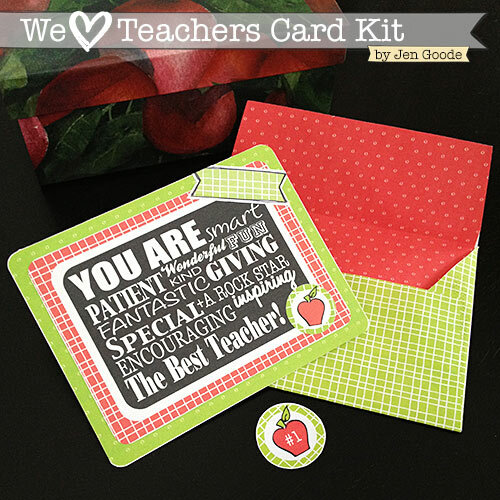 Download this free printable Teacher Appreciation Card Kit here. Stop by 100 directions for more crafty inspiration and to enter the Show your Appreciation giveaway today (you get a new entry each time your visit our guest blogger)! We are giving away hundreds of dollars worth of fun goodies! You won’t want to miss this! Love the colors and details on the card. thanks for sharing! These are so cute! I wish I had had them when my kids were younger, but they are great gifts for those Sunday School teachers and volunteers at the church also! What a great idea!!!! This could go along with a book my aunt wrote called Hooked on Riddles. She has been a 3rd grade teacher forever and published this book last year which is uses riddles as a teaching tool! This is so,cute! 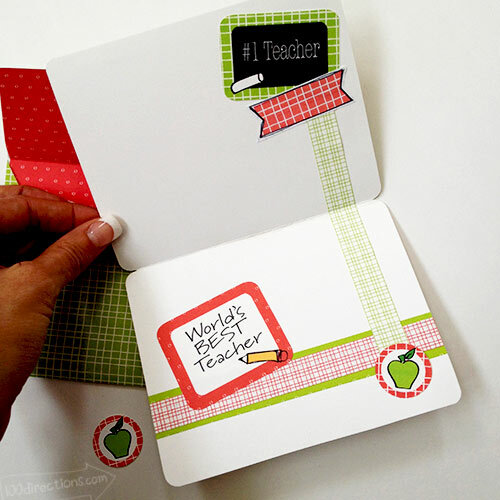 I always do end of year cards for teachers too. This could work for so many occasions!